Congress should make it easier for local officials to kill some of the sea lions that prey on threatened salmon and steelhead in the Columbia River Basin. 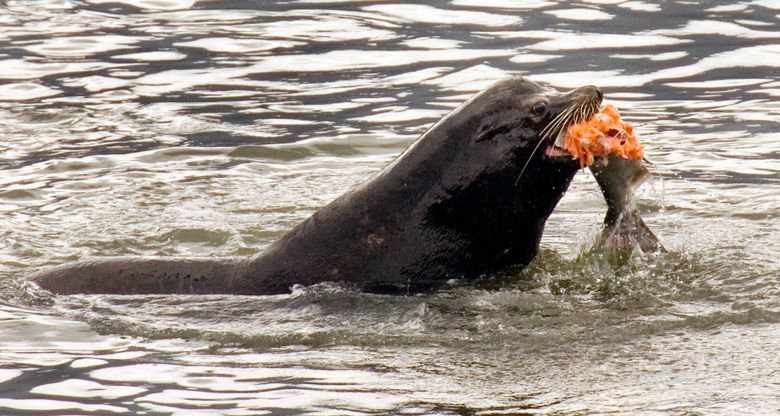 The sea lions are doing fine — the salmon, not so much. State, federal and local governments have spent too much time and money restoring fish runs in the Columbia River Basin to let those efforts go to waste. The ravenous marine mammals are also gobbling up steelhead at Willamette Falls in Oregon. Fish and wildlife scientists estimate that there is a 90 percent likelihood of at least one of the river’s wild steelhead runs going extinct if the feeding there continues unabated. Meanwhile, the population of California sea lions has rebounded nicely in recent years, making the loss of a small number of animals less of a concern. About 300,000 of California sea lions exist today, up from only about 10,000 in the 1950s. Wildlife officials estimate that removing as few as 200 of the California sea lions in the Columbia River Basin could make a big difference for local fish. Right now, however, sea lions can be euthanized only if they are spotted eating a fish in a select area around the Bonneville Dam — and only after officials have trapped them, marked them, observed them several more times and attempted to scare them away. Such hazing activity not only fails to keep sea lions away long-term, but it can prove dangerous to humans, in part due to weather and turbulent water conditions. In 2017, fishing technician Greg George, of the Yakama Nation, died after his crew’s boat capsized during an operation to monitor sea lions near the Bonneville Dam. Changing the federal law would allow states and tribes to kill predatory California or Steller sea lions without going through the lengthy trapping, hazing and observation process, so long as the animals are spotted far enough upstream in the Columbia River or in tributaries that serve as spawning grounds for vulnerable species. At the same time, an advance permitting process and yearly cap on sea-lion killings would prevent lasting damage to sea lion populations. The governors of Washington, Oregon and Idaho — two Democrats and a Republican — have all urged Congress to pass this measure to help stem the loss of salmon and steelhead in the Columbia. Members of the Senate, including possible holdout Oregon Democrat Jeff Merkley, should listen to the governors’ bipartisan plea. Additionally, Washington Democratic Sen. Maria Cantwell must show leadership on this issue by getting her Democratic colleagues on board with the legislation, a version of which she is now co-sponsoring in the Senate. Given her position on the Senate Commerce Committee and the seniority she has gained over nearly 18 years in office, Cantwell should be able to muscle the bill through. Not closing this deal, thereby leaving the issue to a future Congress, could mean losing some Northwest fish runs forever.